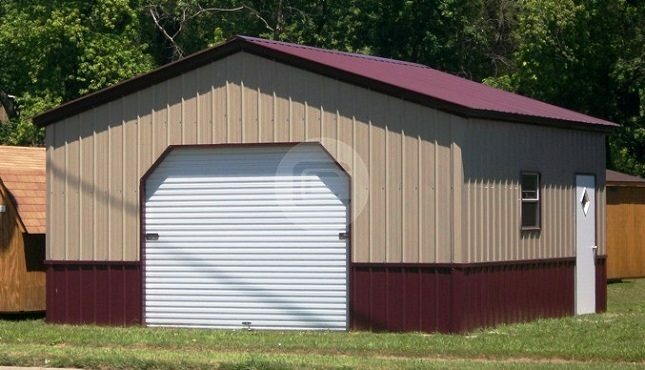 The 18’W x 20’L x 9’H deluxe garage is showcasing our two-tone (wainscot) color option. It includes all-vertical paneling, one 9’x8’ garage door with 45-degree Dutch frame-outs, one standard walk-in door, and one standard window. This unique 20’ long garage can not only protect vehicles from the weather, but also be converted into a hobby shop. The ideas are endless! For assistance with purchasing this garage or designing your own, call us today at (844) 860-4950 to speak with a building specialist.